Kelsey + Joe are finally husband and wife and their day couldn’t have been more perfect! We started the day with Kelsey and her girls at Renee’s Salon in Brecksville. Everyone was busy getting all glammed up while drinking mimosas in their matching robes. The day started out a little rainy thanks to hurricane season BUT we’re totally believers in rain bringing good luck! The girls finished off the morning at Kelseys moms house and she had the cutest first look with her girls. At the church, her dad and step dad were able to have a few moments with her before walking down the aisle and the tears were flowing. They had a Catholic ceremony at St. Borromeo in Parma with a bubble exit! Everything about their day was just SO good. 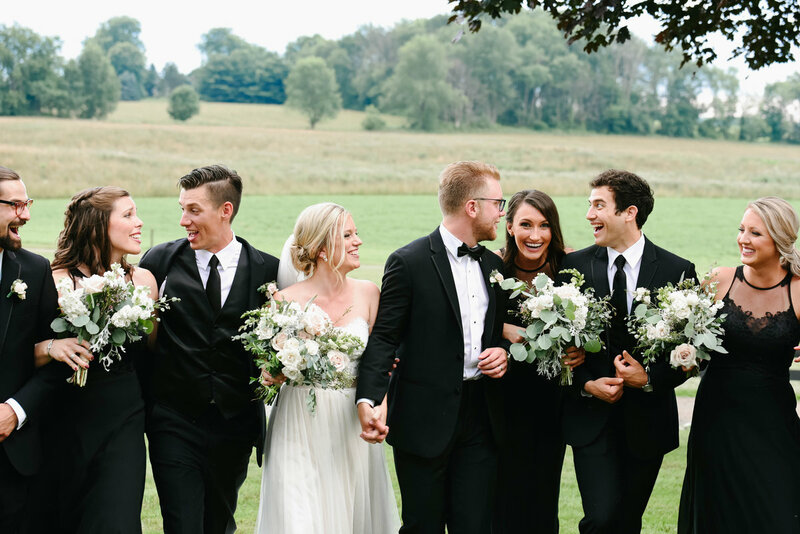 Their bridal party photos were taken at Baldwin Wallace and their reception was one heck of a party. Scroll down to see some of our favorite moments! Cheers to Kelsey + Joe! We had a freakin’ blast with you two and we wish you nothing but the best! Thanks for stopping in! Since you’re here, leave the bride + groom some love! If they get 20 comments on their post, they’ll receive an enlargement of their favorite photo on us! XO! These pictures are beautiful! You two were such a blast to work with. You were so fun and you are amazing at what you do! Thanks for being a part of their special day and for taking fabulous photos that they will cherish forever! What beautiful pictures! It will be very difficult to choose just a couple! Great job. What a great job on capturing precious memories! The day went by so fast now we can take time and look back at the loving moments and fun times. Beautiful! Such a great celebration! I was so blessed to be apart of such an amazing day in your lives! The picture are stunning great work!